Read more about RM-11836: All-digital AM should be the "final solution"
This year's EAS test was different as it was tainted by political rhetoric surrounding the the fact that this was the first year that Wireless Emergency Alert (WEA) would be integrated into the national test and that the alert would appear on mobile devices as "Presidential Alert". Overall, radio had a 78.7% participation in this year's test. This is a slight increase from 78.5% in 2017. LPFM's participation this year was 48.4%, this is a slight decrease from 48.5% in the previous test. Of the 3,802 radio broadcasters that failed to file in the 2018 test, 1,121 (29%) of these stations were LPFMs. LPTV (Low Power Television) had a massive slump in participation this year falling from 66.3% in 2017 to 41.5% in the most recent test. For the second year in a row, low power broadcasters (LPFM and LPTV) were called out for "[reducing] the overall participation rate of all broadcasters". Of the 962 LPFMs that did participate, 869 (90.3%) successfully received the alert and 789 (82.0%) successfully retransmitted the alert. By comparison, in 2017, 92.5% of stations received the alert and 83.8% did rebroadcast it. 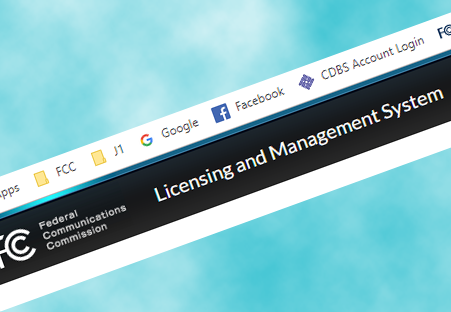 Based on credible reports from Commission staff, REC can confirm that the FCC Media Bureau plans to require the use of the License Management System (LMS) for renewal filings in the upcoming cycle. The first renewal filings for Maryland, D.C., Virginia and West Virginia must be filed on or just before June 1, 2019.